What time is it? Muscadine time…. One of my favorite things about the arrival of fall would be grapes! Muscadine grapes…. native to the south grapes. We know, as they turn into those sweet little balls of deliciousness and ripen into nature’s candy, that fall is on our doorstep. And for those of us who are drained by the heat and humidity of another North Carolina summer, they are a harbinger of cooler days ahead! 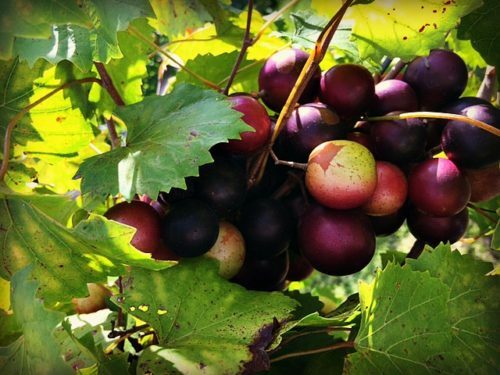 Scuppernong grapes are muscadines, but not all muscadines are scuppernongs…. got it? Scuppernong is a variety of muscadine… but many of us grew up with only scuppernongs and thinking they were one an the same and only muscadine, so we grew up believing what turned out to be a myth. OK… back to the topic at hand! 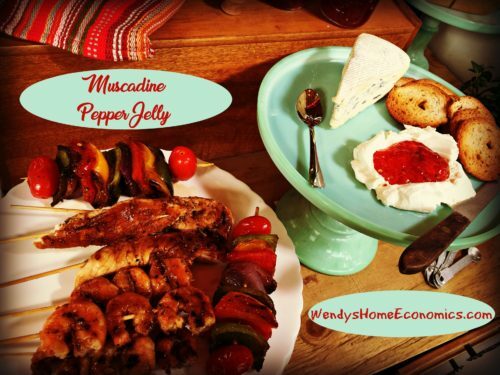 So, I’d never cooked anything using muscadine grapes. The few recipes I’d come across just seemed like a whole lot of work with those seeds and skins and all… for only a few bites of something. Oh my, was I WRONG! 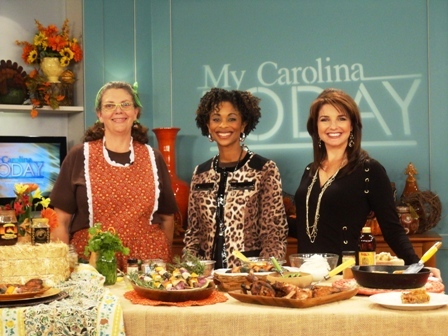 A couple of years back, my old friend Lisa Prince (at NC Department of Agriculture) asked me if I would like to be a part of an episode of Flavor, NC they were going to be filming on muscadine grapes! And if so, I would need to come up with a few recipes using them. 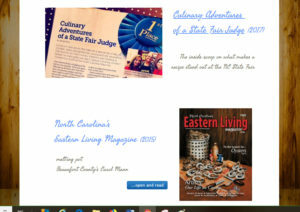 Well of course I would LOVE to be a part of a show I love… and helping promote goodness grown here in North Carolina… but I admit, a bit of panic set in about creating grape recipes! But I love a challenge and new culinary adventures, so I jumped right on it. However… my first question as we were to film in November…. where the heck shall I get grapes at that time of year? First thing I learned… you can freeze grapes! Whaaaat? Yep, Lisa assured me so and said they would have bags for me to work with! Who knew?!? So folks, as we are in the prime days of our muscadine grape season here in North Carolina, grab yourself some big old zippered bags and freeze away! 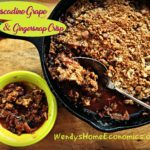 Because when you see my Muscadine Crisp recipe, you’ll know why. So with that worry aside, I started googling, and “Pinteresting” (my new word) to find inspirations and “how-tos” from others who have created muscadine grape recipes. I quickly learned… these are about as scarce as a fresh muscadine grape in April! I could count on one hand anything close to what you’d call “creative” that my searches turned up. Well it just so happened that in the time between I was to do this creation and then make again for filming the show, I had previously planned another of my culinary adventures up… wayyyyyy up in the NC mountains to the John Campbell Folk School, for a week-long 18th Century Open Hearth Cooking Class! 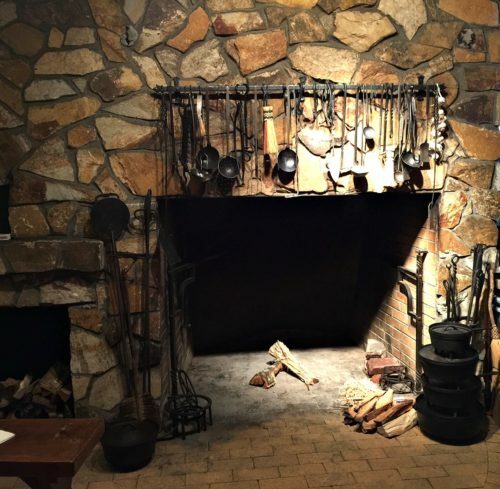 So… in my hearth cooking class, where I learned the most amazing things and actually cooked in a ginormous hearth so big we could bend over up in it to move pots and kettles and coals around (while hobbling on crutches as well), we cooked things each day, 100% authentic to that era. Hearth at John Campbell Folk School and WAY bigger than it looks in this picture! We even learned which of the herbs we could harvest from the garden there to use in our cooking since not all of them had been brought “here” yet. 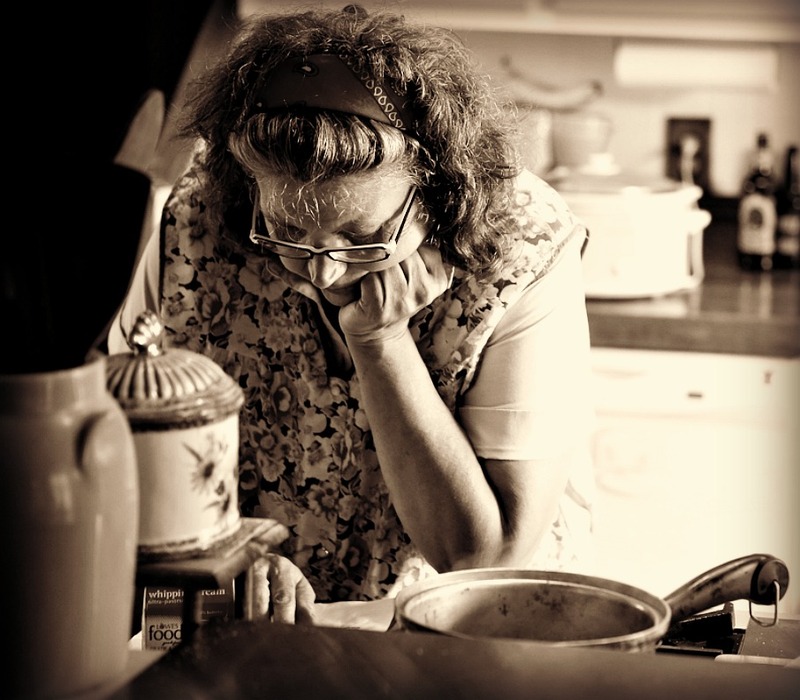 Recipe choices would be laid out on a wooden table (that was, of course, made at the school in the woodworking shop) that was draped in vintage cloth and we would select those we wanted to prepare. Well normally, I wouldn’t choose any sort of baked thing, but low and behold, there laid a “receipt” for a Muscadine Pie! And as it was in October, there were muscadine grapes there in the mountains in our pantry fridge. I grabbed that one right away so I could get down to the nitty gritty (and get my fingers stained and “broke in”) of this muscadine phobia here, where I had an instructor who could help me with this self-imposed terror. 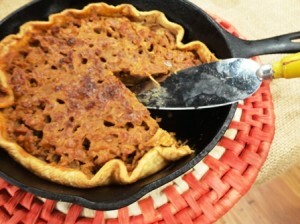 First, I had to… MAKE DOUGH for my pie! A terrifying thing in itself…. that turned out to be a piece of cake. 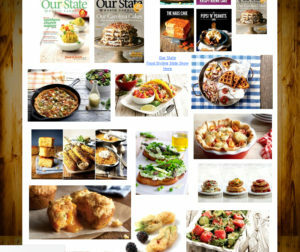 Without belaboring this story to get to why we are here (my Flavor, NC grape recipes! ), I share my very first ever muscadine creation! 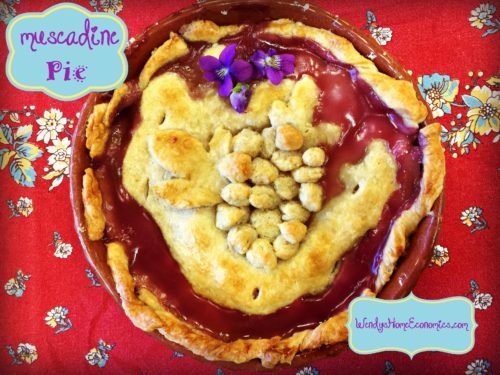 I even “garnished” it with some edible violets from the garden and a dough design of a bunch of grapes (unlike how you see muscadines growing)… LOL Pretty snazzy, eh? And I’m here to tell you, this may have been the b.e.s.t. pie to ever cross my lips. It SO inspired me to get in my cookhouse when I returned home to create muscadine recipes for the show. 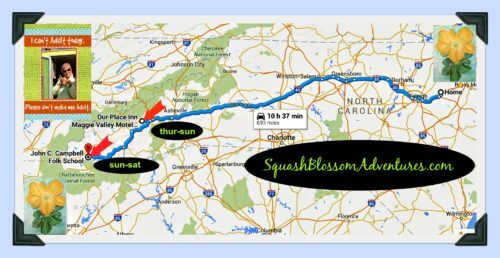 I think the timing was surely one of those Godwink moments… to put that muscadine challenge before me, the week before I was to attempt my first creations, with few resources “out there” to help me. 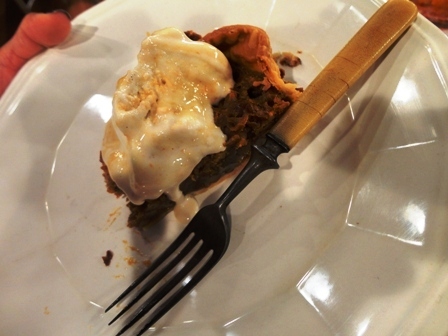 I knew in that moment as I savored that deep, rich grape infused pie… yet, I’ve got this too! 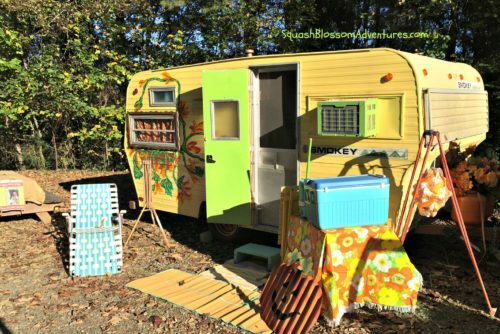 My adventure to John Campbell Folk School! I didn’t fully set up Squash Blossom due to an ongoing foot “issue” but just enough to sleep at night! So this is the abbreviated Blossom…. My mini Squash Blossom set up at John Campbell Folk School. So… back at home, it was time to hunker down and get some muscadine recipes created for the show! I had sent Lisa my thoughts and she liked them all. My creations were Muscadine Pepper Jelly, Muscadine Shrub and Muscadine Grape and Gingersnap Crisp. Now I’m here to tell you, although I don’t care for a lot of sweets, this crisp may be in my “Top 5” of the best things to ever cross my lips in that category… not to mention the incredibly wondermous smell of it fresh out of the oven! 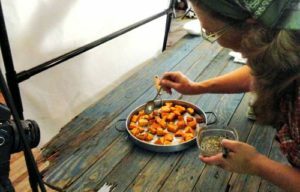 We had such a fun time filming this episode in my vintage cookhouse and in the process, I overcame my intimidation of “the grape” cooking, created some tasty recipes, and fill my freezer each fall with grapes to enjoy making my crisp during cold, winter, fireplace months. 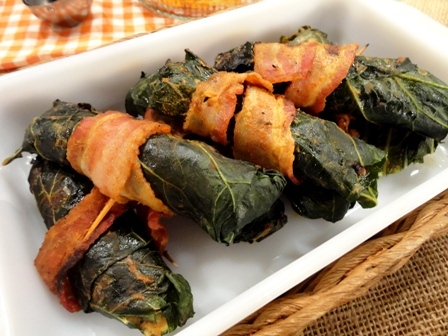 Find and enjoy all 3 of my Flavor, NC Muscadine Grape recipes down below. 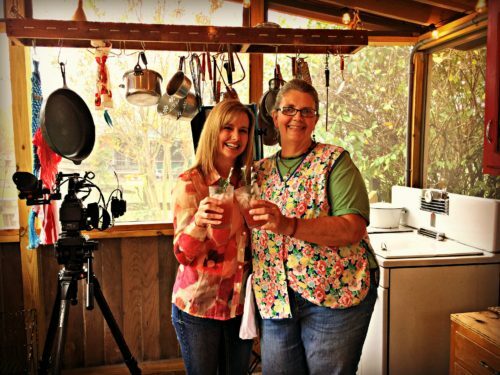 Fun day filming Flavor, NC Muscadine Grape Episode in my cookhouse with friend Lisa Prince! We had this crisp for our family Christmas dessert last year, and might again this year too. 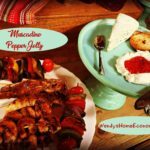 My Muscadine Pepper Jelly is yummy over cream cheese… or as a baste on chicken or pork & veggie kabaobs! 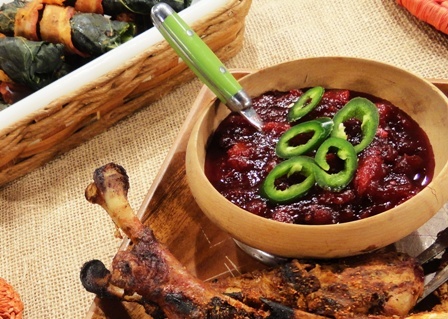 Muscadine Pepper Jelly over Cream Cheese or as a Chicken or Pork & Veggie Kabob Baste! And to freshen up, how about a nice Muscadine Shrub? Refreshing Muscadine Grape Shrubs for Flavor, NC! I hope you will enjoy my recipes, and leave a comment about ways you enjoy muscadine grapes too! To prepare grapes: Over bowl (to capture juices), cut grapes in half (scissors work best) and push seeds out with thumb. Toss grape halves (hull and pulp) and juice into bowl. Stir in sugar and flour. Mix well and put mixture into prepared baking dish. Put all topping ingredients except butter into food processor. Pulse until cookies are roughly chopped. Add butter and continue pulsing until incorporated and mixture is crumbly. Scatter crumbs over grape mixture. Bake about 30-40 minutes until hot and bubbly. Baking time will vary a bit depending on depth of baking dish. *If grapes are super ripe and sweet, you might use a bit less sugar. This recipe will do best in 9×9” or 11×7” baking dish. 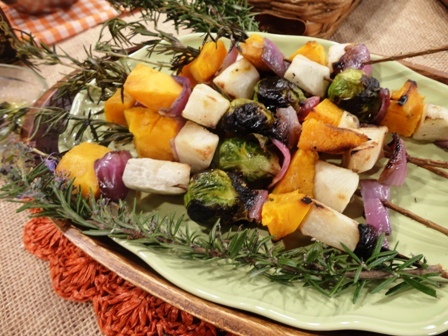 This tasty jelly can be warmed and used as a glaze on meat and vegetable kabobs! Serve over salty and tart cheeses on toast as an appetizer too. The muscadine flavor really shines through with this jelly. If using purple/black hulled grapes, the rich red-hued color is spectacular! Heat grape juice and pectin in heavy bottomed pot. Whisk to dissolve the pectin. Stir in sugar and peppers. Bring to a boil for one minute. Remove from heat and put into hot sterilized jars. Process as usual. This refreshing old-fashioned “tonic” is making a comeback. The syrup is really versatile and can be used for all sorts of tasty beverage concoctions. 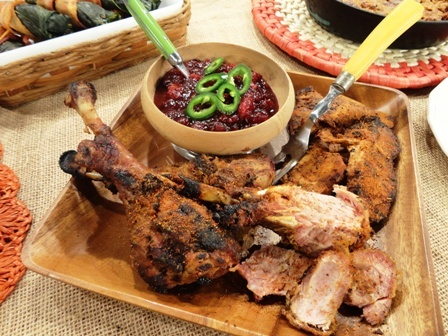 Such an easy way to enjoy the rich flavor of muscadines throughout the year! Combine grapes and sugar in large jar with lid. Muddle to break up grapes and incorporate with sugar. Cover and sit in a cool dark space for up to 24 hours. Shake occasionally so that sugar dissolves. Add vinegar and any aromatics as desired. Cover and shake. Let this mixture steep in cool dark place or refrigerator for about a week (or more) to let the flavors meld. Using a sieve or cheesecloth, strain the syrup into jar. This mixture will keep in the refrigerator up to six months (if it lasts that long!). 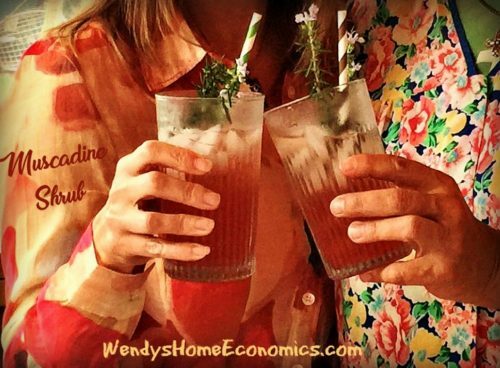 To serve: Pour a bit of the syrup over ice and top with club soda or sparkling water. For cocktails, omit the water and add a splash of liquor. Those that work well are vodka, rum and gin. Generally, you will want to mix one part syrup to about 3-4 parts sparkling water. Champagne shrubs are tasty too! Sugar options: Most any sugar (and combinations) will work. Just be sure the sugar you use complements the grapes (or whatever fruit you use). 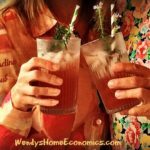 Vinegar options: Apple cider vinegar tends to offer best flavor for shrubs, but other flavorful vinegars work nicely, as long as they do not complete with and drown out flavor of the grapes. 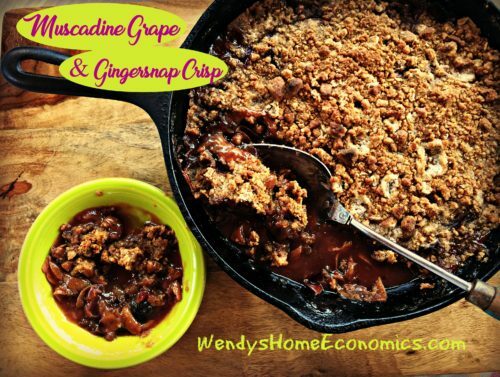 So… visit a local muscadine farm right now while the get’n is good… and if you don’t have time to use them, fill up your freezer so when hunkered down on a cold winter’s day, you can make yourself this Crisp… you will be SO glad you did!